** The National Quilting Association started National Quilting Day in 1991. You can download a free pattern on their site. esa falda me está cerrando el ojo.... espero pronto hacer algo así!! Then it's a good thing we have our quilt class every Saturday! Looking forward to it more than ever. Thanks! 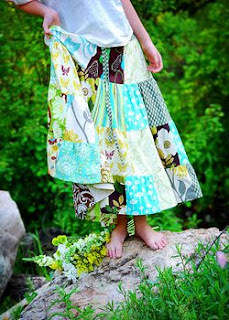 Looks like the sundress I made for Elizabeth. Who knew I was so on top of fashion.